Several persons, including the victims of last Saturday’s demolition exercise in Owerri, have condemned the stories put out by Imo State Government and security agencies, to the effect that nobody died in the incident. Speaking exclusively to Vanguard yesterday in his 23 Oguamanam Street, Owerri residence, Mr. Isaiah Ibeanusi, father of the slain Somtochukwu Ibeanusi, expressed regret that government and the Commissioner of Police, Mr. Chris Ezike, could feed the public lies. His words: “How can they say that nobody died in the incident, when my only son is now lying in the morgue of the Federal Medical Centre, FMC, Owerri? This is very sad. “My 10-year-old son and his sister were religiously carrying out my instructions of moving our wares to a safe place,” adding that not long after, news that somebody had been killed rented the air. He said after depositing the boy’s corpse at FMC morgue, he went to complain to Archbishop Anthony Obinna at Maria Assumpta Cathedral, Owerri. When Vanguard visited Mr. Sebastian Oparaku in the male ward of FMC, he narrated how a stray bullet hit him when he was shaving inside his house. “I thank God that I am still alive to tell my story; I can say that since I didn’t die on that first night, there is hope that I will live,” Oparaku said and dozed off. In his account, Mr. Leonard Ebubeagu Osuji, who still has a bullet lodged in his thigh, said Owerri people remained committed to sustaining their ancestral market, Ekeukwu Owerri. He said: “It is shocking to hear that no life was lost and the operation was successfully executed. “I am billed for an operation tomorrow (today), to extract a bullet lodged inside my thigh. Police Commissioner Contacted, the state’s Commissioner of Police, Mr. Chris Ezike, said no report was lodged in any police formation in the state. 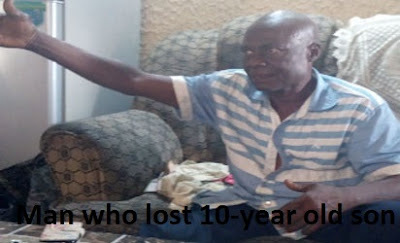 Told that Vanguard was calling him from the residence of the slain Somtochukwu, the Police boss said he will send intelligence officers to interview the family.